Aren’t electric cars better than using biofuels? Why don’t we just focus on using electric cars? In the short-to-medium term the GHG reduction potential arising from the enhanced use of renewable ethanol is much higher than that of electric vehicles. For electric cars to have a net positive contribution to emissions reduction will require a long-term change in energy supply infrastructure. If most of today’s electric cars are powered by coal-produced electricity, it defeats the purpose of attempting to decarbonise. What kind of cars are actually on the roads? 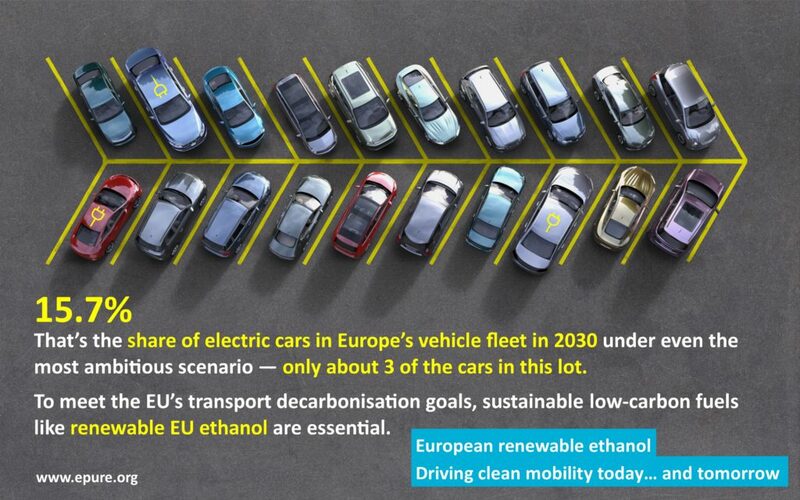 Virtually all of them are cars with internal combustion engines – meaning that to achieve EU decarbonisation goals we will need low-carbon biofuels like EU ethanol. According to the latest research from Ricardo Energy & Environment, a high percentage of cars with internal combustion engines will still be on Europe’s roads for decades, meaning Europe’s push to decarbonise road transport would benefit significantly from the use of low-carbon fuels such as renewable ethanol. Won’t there be a lot of electric cars in the future? Yes, but not for a long time. According to the Ricardo study, even under the most ambitious scenario, in which EVs would make up more 20% of the passenger car sales in 2025 and 40% in 2030, they would still make up only 15.7% of the 2030 EU passenger car fleet. That means betting only on one solution is not enough to decarbonise transport: we need a variety of tools to decarbonise the majority of existing and future fleet still running on liquid fuels. Electric vehicles will bring great benefits to transport, but they cannot do the whole job. Europe needs a mix that includes sustainably produced low-carbon fuels such as ethanol.